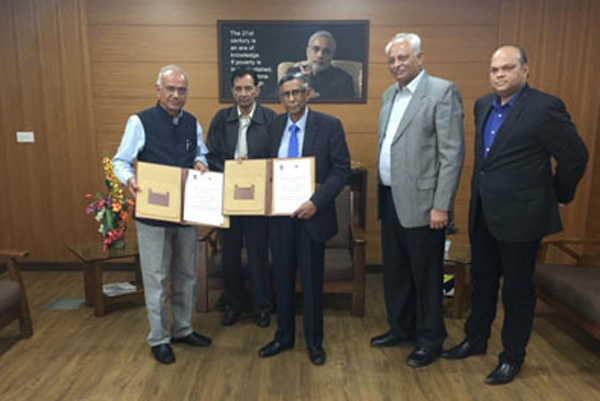 The Institute of Certified Management of Accountants of Sri Lanka (CMA) entered into collaboration with the Gujarat Forensic Sciences University (GFSU) Gandhinagar, Ahmedabad, Gujarat India by signing a Memorandum of Understanding (MoU) recently. The MoU was signed by the Dr. J. M. Vyas Director General GFSU and Prof. Lakshman R Watawala President CMA. As per the MoU, GFSU will provide consultancy and technical support to set up a specialized Institute of Forensic Sciences which will conduct programmes in Forensic Accounting, Cyber Security, Digital Security, Forensic Sciences, Digital Forensics and other Forensic Courses at the institute in Sri Lanka. GFSU shall accept students from Sri Lanka to study Master degree courses at GFSU campus as per admission eligibility. GFSU has also agreed with the assistance of CMA and in consultation with the respective governmental agencies to immediately arrange for the training programs for Judiciary, public prosecutors, Police department, Forensic Experts and other investigating agencies of Sri Lanka at GFSU Campus, Gandhinagar, Ahmedabad. GFSU have conducted training programmes for over 4300 comprising of Judges, IAS/IFS/IPS/IRS, Police Officers, Public Prosecutors, Foreign Officials, Medical Officers and others.